The Marksman fires a harmless, narrow laser beam and computes speed using the simple change of position over time formula, rather than a radio frequency shift. While radar projects a broad, cone-shaped beam 200 to 400 feet wide, with an effective range of only a few hundred yards, the Marksman's beam widens to just 3 feet at this range and can reach farther. Individual vehicles can be isolated during heavy traffic due to laser's pinpoint accuracy. Laser speed detection renders radar detectors useless, and thus isolates the most flagrant speeders. 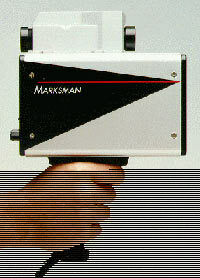 The Marksman measures speed in 1/3 second, not nearly enough time for a driver to react to a laser detector warning. Doubling as an instant range-finder, accident scenes can be measured and cleared 66% faster, thus facilitating the return to normal traffic flows. Additionally, using LTI's unique QuickMap Data Collection package, accident scenes can be mapped electronically, eliminating clipboards, pencils and office data reentry. SWAT teams utilize this range function, as do the city traffic engineers. Product enhancements such as SpeedStat software also provide a potential for collecting raw data which can be easily accessed for highway surveys and spot checks along roadways. The Marksman downloads complete traffic data surveys via standard serial port and SpeedStat software, to a separate laptop computer, in reports including all statistical data and time/date groupings. The superior court evidence laser provides will not only save overtime money spent in the court, but also frees up personnel for more time in the field. The Marksman has been tested and approved in over one dozen countries around the world, and is used in 44 states. NASA also depends on the Marksman to measure the distance and closing speed of approaching satellites, and has made it standard shuttle flight equipment. Increased highway safety, additional revenue for the city's general fund, instant range finding capability, and more effective use of personnel make the Marksman the most effective speed enforcement tool available today.